The Respa Luxury Support 2000 4' Mattress features the RespaForm Pocket 2000 spring system, finished with a quilted detachable pillow top in a knitted soft touch fabric. 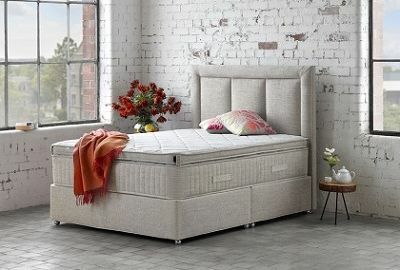 Incorporating Respa Airflow Technology with an open cell Airflow Foam for added breathability and a high-density foam interior for edge to edge support, this mattress exudes style, support, and comfort. This mattress offers medium - firm support and its ecommended that the pillow top is turned regularly. The Respa Luxury Support 2000 4' Mattress is part of the Lifestyle Collection, Respa's newest collection of beds and mattresses. Featuring a 2000 RespaForm Pocket Spring System and Mini-Pocket Spring System, this mattress also boasts a Quilted Detachable Pillow Top finished in a Soft Touch Fabric. Offering Medium-Firm Support, this mattress also has a High-density Foam Interior that encapsulates the spring unit for Edge to Edge Support. Whilst the Respa Airflow Technology offers Thermoregulation Qualities ensuring optimum mattress breathability, airflow, and temperature control. This mattress measures 38cm Deep and is highly recommended for Complete Spinal Support and Backcare. The Respa Luxury Support Small Double Mattress comes with a substantial 10 Year Guarantee and benefits from Free Delivery and Free Collection and Recycling of Your Old Mattress throughout Northern Ireland, and Counties Monaghan, Louth and Dublin, in the Republic of Ireland.